Two of the most bashed railway bridges in the UK are located less than a mile apart, according to Network Rail. The Barrowby Road bridge in Grantham, Lincolnshire has been hit 32 times in the past year and nearby Springfield Road bridge has had 16 collisions. 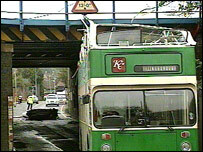 A Road Safety Bill proposes a £5,000 fine along with a six-point endorsement for drivers who hit railway bridges. Ben Herbert of Network Rail said "bridge bashing" causes about £10m in damages every year. Five railway bridges have been hit more than 100 times since 1995, including the Barrowby bridge and others in Swindon, Litchfield, Lower Sydenham in South London and Ely. Mr Herbert said: "Bridge crashes are a major disruption on the rail network across the country for road and rail passengers." The accidents have resulted in one million minutes in train delays in past three years. "The railway is closed while we have structural engineers to check damage to the bridge - and although the vehicle usually comes off a lot worse than the bridge we still have to close the railway." Lincolnshire police spokesman Sgt Roger Bates said: "The Barrowby bridge is very well sign-posted but lorries do need to make a large sweep as they approach the bridge to get around the corner." Mr Herbert said: "We have fitted collision protection beams and chevron marking and improved signage yet they still carry on getting struck. "It is down to the lorry drivers knowing their route and the height of their vehicles," he said.